There was a dead cockroach outside our home yesterday, and my toddler bounced outside directly onto the path of the scavenging ants. I heard Yakee start scolding him, and I was also called to intervene. Yakee reminded me that his younger brother was shoeless and could be bitten. Cute, right? But I did say he was scolding his younger brother right? He basically scolded Yamee for killing some ants, and went on to say the younger one better go inside while he looks for the ant cemetery. Yakee kept repeating the words 'ant cemetery' and I was really amazed at how he just assumed there was one. I was also thinking of how ironic it is that he assumed there is one, when ants usually scavenge off any dead animal's corpse. 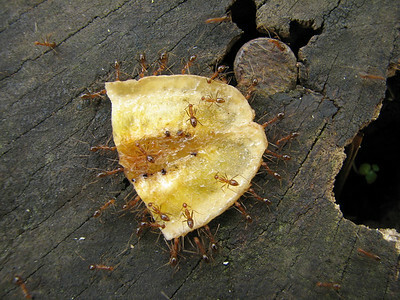 Remember that question about whether ants also get scavenged by ants when they die? I posted that on Facebook and a friend told me that ants actually gather the bodies of their dead ones and put them in the center of their ant colony. This, he knew, from having ant farms as a child. What do you know, my son's instinct was spot on! And I'm actually thinking that this is another nudge for me to get an art farm for the boys someday. And then I think about all the other conversations I have had with my eldest on death. His everyday questions of whether I'd die has ceased. Now, if he ever mentions death, it's usually him pretending to die. And how my heart twinges a little for that someday where death conversations would be serious, real... and maybe even close. We may never ever go to casket sales (unless it's our business) but I sure do wish we could raise the boys with a working relationship with their parents' mortality. Who knows, we may even consult them for some funeral advice, just so we can get their inputs on what will make things a little more convenient for them. I have started on a living will of sorts, details about the funeral that I want... but I think I have lost that file. And well, embracing Waldorf has made me reconsider cremation. I know that's still far into the future. But everytime I realize how much my boys have grown, I also seem to get a taste of graduations, teenage years, marriage and a time when we don't see each other all the time anymore. But as they say, parenting is a slow process of letting go. But for now, yes, I will consider the ant farm (preferably when Yamee is around five years old already and more likely to respect the creatures).